Insightful Innuendo: Gracias, Leo Messi. 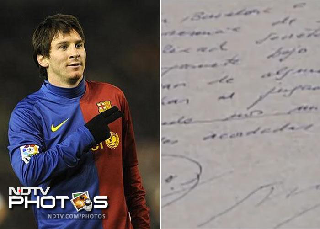 The scouts of FC Barcelona had received rumours about a genius footballer from Argentina. They got in touch with Messi’s father and arranged a two-week selection session for the boy. But you know what happened? In a matter of seconds of watching him play, Charly Rexach, the club's sporting director, made up his mind and wanted to sign him! And there you have the story of the famous paper napkin on which they signed a contract! However, this popular story isn’t the thing I’m getting at—it’s his journey that has inspired me. For 8 years the boy had to take injections as part of his treatment. He used to thrust the injections into his thighs day in and day out along with his rigorous training at the club. The pain he experienced was excruciating; yet he persevered with the solidity of a diamond. Imagine putting a needle into your legs and then running for miles and miles on end, day in-day out! And doing this for 8 years of your life?! Such is the unrelenting passion and love for the game that drives this wonder boy. The sheer magnitude of what he has overcome to become what he is today is in itself awe-inspiring. Once this momentous realization begins to dawn, you can only genuflect at the altar of The Greatest Footballer Of All Time and say, “Gracias, Leo Messi."